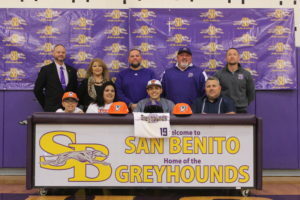 San Benito Varsity Baseball pitcher Danny Dial Jr. signed to play baseball for the University of Texas-Rio Grande Valley’s Vaqueros baseball team. The signing took place Wednesday afternoon at the Greyhound Gym. Dial received various offers from higher education institutions including Our Lady of the Lake and Temple College but UTRGV’s offer to pay Dial’s tuition in full for four years led him to choose the university. “”UTRGV is an amazing school, it’s Division 1 and a great campus,” said Dial. Dial understands the challenges facing him moving into college baseball, such as the stronger players and competition. But he plans to lift weights to improve his overall performance to complete his plan of being a starter. Click here to get the full story or make sure to grab a copy at one of our various newspaper racks. Thank you!